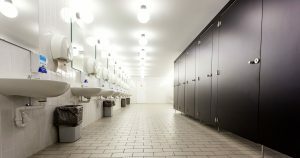 The Importance of Commercial Restroom Cleaning | Ace Uniform Services, Inc.
Never neglect the cleanliness of your commercial restrooms! Every aspect of your business that people encounter reflects your professionalism and the quality of your work. From the floor to the ceiling and everywhere in between, you want your customers to know that you value their perception of your company. Ensuring that your restroom facilities are regularly serviced by a professional cleaning company serves as proof to your customers and employees that you not only care about their opinions but that you also care about their experience. Restroom services should be considered an important aspect of all business operations. It’s a major physical part of your company that people begin to judge as soon as they open the door. When people use public restrooms, they’re expecting a sterile environment that will leave them feeling as clean as they felt when they walked in. As a reflection of your professionalism, regular restroom services show that you have an attention to detail that extends beyond the business aspects of your company. Public restrooms see more traffic than your bathroom at home. Therefore, be sure that all the features are always functioning properly and if not, be sure to label those issues that need attention by a professional cleaning company. An extra step that you and your employees can take is to have a system in place that when issues need to be addressed, they are properly reported. While your employees may share the responsibility for daily restroom checks and spot cleaning, a professional cleaning company can ensure that the environment is fully sanitized. It’s important that public restrooms be professionally serviced to protect the health and hygiene of everyone in the environment. Both your customers as well as employees are putting their trust in your business that the facilities you are offering are safe, functional, and hygienic. It shows your commitment to your business relationship and customer service. Here are a few tips to consider in keeping your restroom clean and ready for public use. As technology continues to evolve, we find that more bathroom features operate using motion sensors. This technology saves resources and makes people feel more sanitary as they eliminate the need to touch surfaces and therefore, spread bacteria. Your restroom facilities also serve as a great opportunity to be energy conscious. It will save you money and express your commitment to protecting the environment. Paper towels, especially when made from recycled materials save energy and are particularly sanitary as they are thrown away after a single use. Add biodegradable and environmentally friendly products to your arsenal, and you’ll have a winning, hygienic combination. This entry was posted on Friday, September 8th, 2017	at 2:31 pm	. You can follow any responses to this entry through the RSS 2.0	feed. Both comments and pings are currently closed.